The April 2013 issue of National Geographic contains a stunning article by Rachel Hartingan Shea called “Europe’s Wild Men.” It describes a project by photographer Charles Fréger, who spent two winters traveling around Europe to document a spectacular array of winter festival costumes. Collected in his book Wilder Mann, these images reveal the dark vitality of ancient, pre-Christian mythic rites that live on in European celebrations, year after year. This fellow to the right, for example, is the German character Pelzmärtle (or Pelzmärtel), who appears at your door with the Christ Child on the eve of Saint Nicholas’ Day in the village of Bad Herrenalb, “to scold naughty children and wrap them with a stick.” The elaborate straw costume is sewed onto its wearer. Then Pelzmärtle makes his way through the town, traveling from travels from door to door and ringing the bell with hoots and hollers. Late on the fifth night Hahawuaqi, “mother of the terrifying monsters,” appears upon the kiva roof and announces in her weird falsetto call that she has arrived and wishes to see the children. An answering voice responds that the children have all gone to bed and urges her to postpone her visit until morning. Thus are the children warned of the presence of the horrible and thrilling beings who bring gifts for good children and punishment for naughty ones. It must fill with trepidation many a little brown Hopi snuggled into blankets and fearfully eager for the coming day. Yet the monsters and their mother do not emerge until late afternoon, when they appear in procession. The mother, a man, leading, wears the black dress and a white mantle and leggings. Her mask is a flat black face, with hair in pigtails such as the women wear, feathers raying from the crown, and a fox-skin ruff. She carries a long Juniper whip, a whitened dipper, and a flat tray covered with gifts for the children: ears of corn, seeds, and bundles of sticks for little girls, and tiny snares of yucca fiber for little boys. The other woman figure, Soyokmana, is such a terrifying old witch as every people in the world seems to have invented to scare children into virtue. She is dressed like the “mother,” but her hair is straggling, her clothes are old and dirty, and she carries a crook in one hand and a knife in the other. The others (Natacka) usually appear in Navajo velvet shirts, belted around slim waists with heavy silver belts, and with white buckskin mantles over the shoulders. They all wear terrifying masks: great snouts, bulging eyes, and horns. Each carries a bow and arrows in his left hand, leaving the right hand free to receive gifts, for this is a begging expedition. It is impossible not to be forcefully reminded of such traditions looking at the array of unnerving costumes so marvelously captured by Fréger. The full photo gallery is viewable here. 1) Fergusson E. Dancing Gods; Indian Ceremonials of New Mexico and Arizona. The University of New Mexico Press. 1931. pp.127-8. 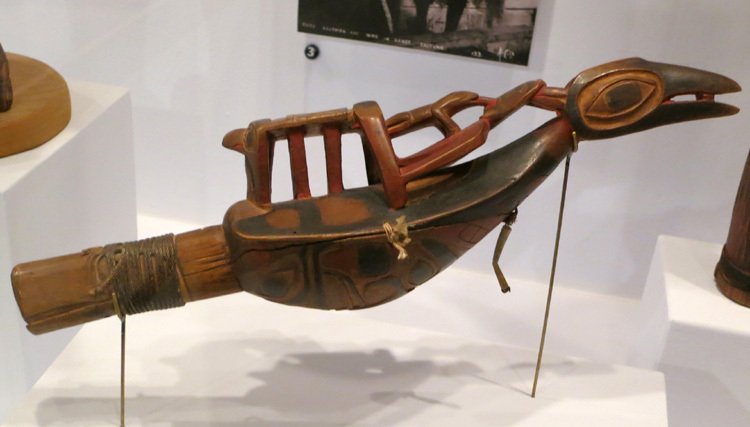 We previously looked at the symbolic structures that organize every aspect of social life and identity of the Native Americans of the Pacific Northwest, including the Tlingit, Haida and Tsimshian peoples. 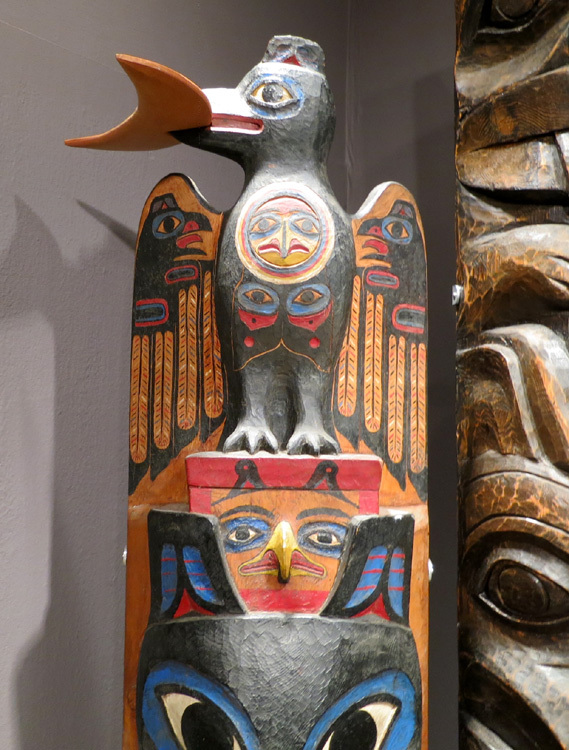 In these societies, social identity is articulated through a complex symbolic vocabulary of hereditary emblems or crests, perhaps best known through the extraordinary visual art of the region, including totem poles. These crests exemplify legendary or mythological forms associated with families or peoples, and may be used to declare public identity, social status, or rights and privileges. As we considered in an analysis of the mythology of the region, these crests are not just visual, but encompass a rich oral tradition of stories and legends that record everything from the birth of the sun to historical movements of people. 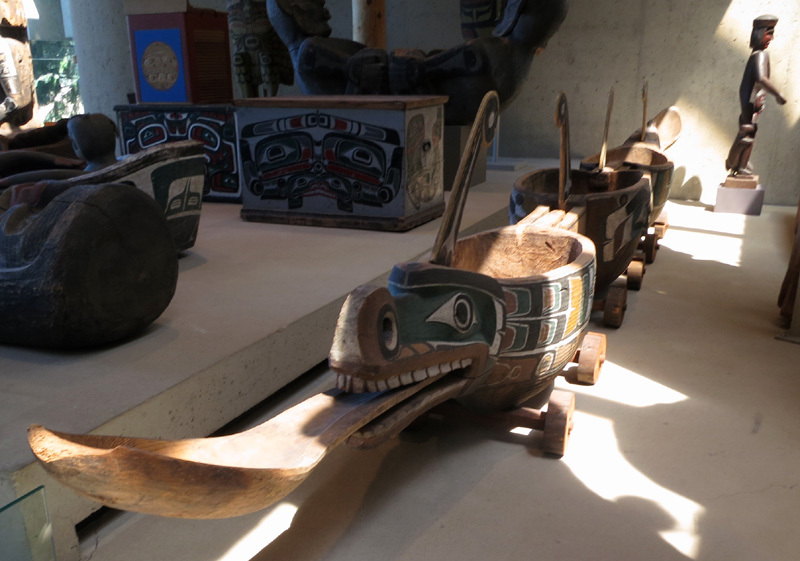 Some of these stories, such as the Tlingit story of their exodus out of Glacier Bay, contain a mix of mythological symbols and historical facts. Another way in which the system of crests may be deployed is through ceremonials, such as the famous potlatch celebrations honored by all of the peoples thus far mentioned. These days-long ceremonies are used to commemorate events of great importance, such as rites of passage or changes in status. The family throwing the potlatch offers a great feast and gives mighty gifts. Slaves may be freed or sacrificed. This picture shows a beautiful train of enormous food vessels, carved to depict the Sisyutl, or double-headed serpent. It was used to wheel in vast quantities of food during such feasts. 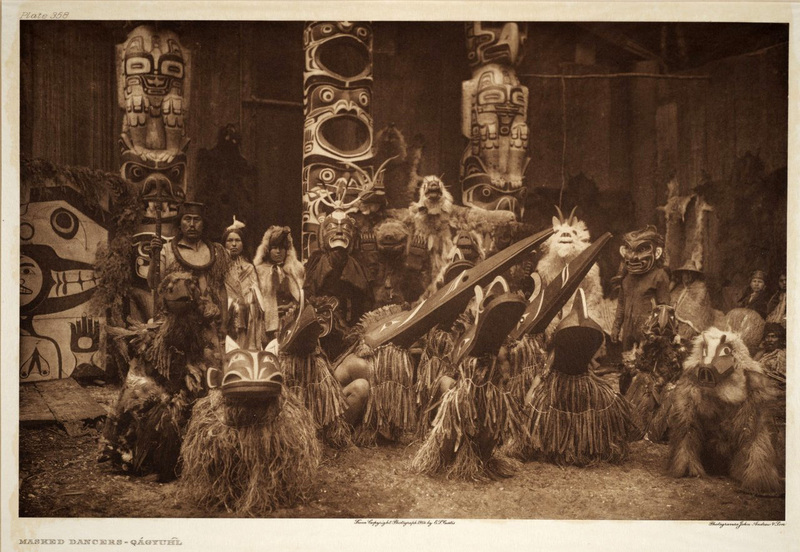 In this post, I would like to give attention to a particularly fascinating expression of this symbolic social economy, the winter dance rites of the Kwakwaka’wakw, otherwise known as the Kwakiutl, a people indigenous to British Columbia. 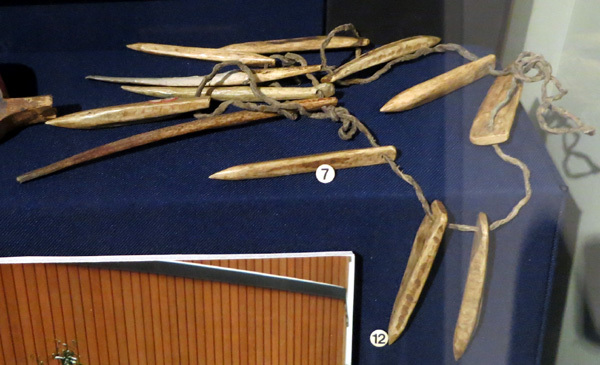 During the spring and summer months, the Kwakiutl used a form of social organization that is substantially similar to other groups in the Northwest, including the use of clan crests and potlatches. However, during the long months of autumn and winter, the regular social order was suspended, and the entire village entered into a complementary period, structured by alternative ritual identities. This period served as the spiritual counterpart to their ordinary economic identities of the summer months. While summer was a time of food gathering and production, during the winter months the men would gather in secret initiatory societies, where they spent long periods preparing for intricate ritual dances. The men of these secret societies used different names during this season; names that were previously bestowed by spirits during shamanic ceremonies. According to the religious historian Sam D. Gill, the winter period was regarded as existing outside of time itself. Ts’e’ts’aeqa constitutes a timeless period that recapitulates the original time outside of time, that zero hour from which all creation is projected, and which is the true domain of mythological forms. Please take a moment to click on and enlarge the magnificent picture to the right, taken by the great ethnographic photographer Edward Curtis. It shows a group of Kwakiutl men in dance regalia in a winter clan house, and conveys a striking sense of the power of these ceremonies. Note the three men crouched in the center, wearing bird masks that extend some seven feet or more in length. 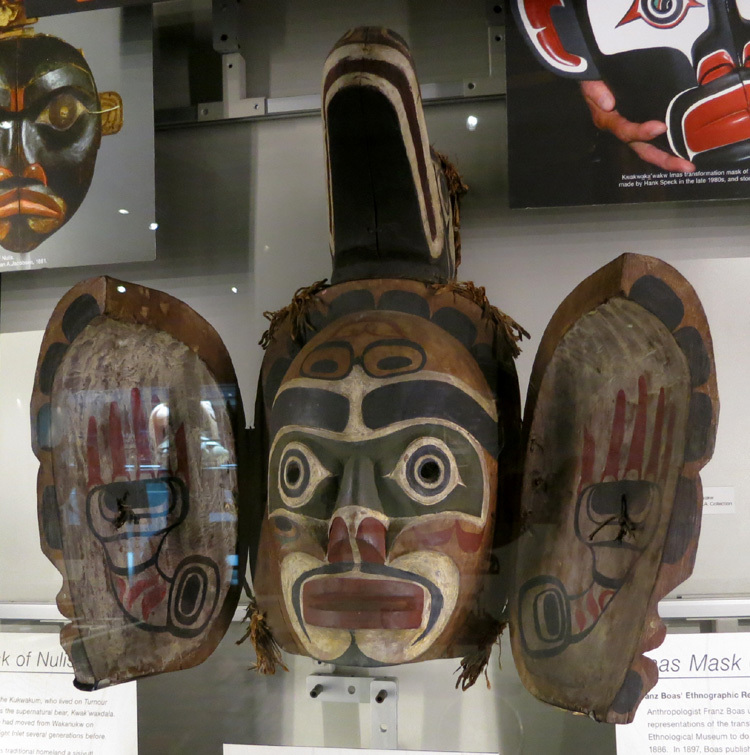 Masks of this kind may be viewed today at the Museum of Anthropology in Vancouver. We have every indication that the ritual effort of the winter ceremonials induced long, sustained periods of trance, supporting an ongoing period of profound relationship with the deepest levels of human consciousness. Masked ritual dances are associated with shamanic cultures in their entire domain, stretching from Tibet and Siberia across the Bering Strait, and reaching all the way down to Tierra del Fuego in South America. However, the Kwakiutl dances are striking in the degree to which they regularly reorganize their society in terms of a complementary set of social symbols which derive not from the ordinary daylight world of labor and production, but from the nighttime realm of the unconscious, inhabited by self-luminous dream images. Like most ritual masked dances, the Kwakiutl dance celebrations reenacted mythological events, and the participants identified with the mythic forms they depicted. Just as the priest at mass is viewed by Catholic theology as literally recapitulating the mystery of incarnation through transubstantiation, and just as the Haitian Vodouist literally becomes a vehicle for the loa, so too in the Kwakiutl there is no separation between the dancer and the spiritual forms they embody. These rituals sometimes articulated mythologies of great violence and power, such as the notorious Hamatsa cannibal dances. Martha Padfield has written an excellent brief analysis of the Hamatsa dances in her Cannibal Dances in the Kwakiutl World, and Franz Boas has treated the topic at some length in the book cited above. The Hamatsa myth that forms the basis for the dances has been recorded in several versions, frequently involving an initiate who travels outside the village (i.e., outside of the normal social order) to the dwelling place of a malevolent being named BaxbakualanuXsi’wae. The hero may kill the spirit and steal its powers, or receive initiation, or some combination of the two. 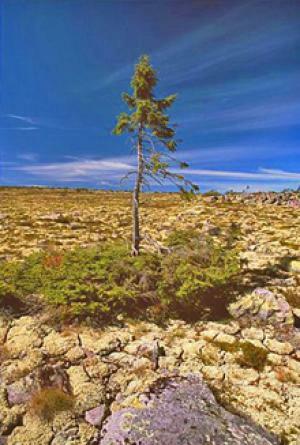 The version of the story that ties directly to the ceremonial tells of a young man named Q’uo’mkilig’a who goes into the woods to find cedar bark, but when he is alone he is possessed by a fearsome being named ho’Xhok”. When he fails to return to his village, his friends and family search the woods and find him lying deep in trance. This myth reflects the tension between the shamanic initiatory crisis, which also takes the form of a spontaneous and prolonged mental breakdown, and ordinary forms of social interaction. Shamanic forms of spirituality are idiosyncratic and highly personal, and often express themselves in opposition to the social order. The Tlingit shaman, for example, was buried outside of the village, and was the only person who could be directly paid for work . In many traditional societies, we find a tension between the personal visionary experience exemplified by the shaman and the organized ritual world of the priest. In contrast to the shaman, the priest’s primary function is not to bring about a psychological breakthrough, but on the contrary: they serve to integrate individuals into the proper social order. The priest’s job is to make sure individuals stay in their role, so they can perform their necessary function for the good of the society. Shamans have always been viewed with profound ambivalence, and regarded as marginal figures in the societies in which they operate. In many cultures, their career could be reliably expected to end with their violent death, as they were routinely killed by angry relatives of those who died by illnesses that the shaman was believed to have caused. In the Hamatsa dance, the wildman figure enacts the return to the village by dancing wildly in the center of a circle of men who try to restrain him. The wildman acts out with varying degrees of literal-mindedness, biting and attacking members of the audience, drawing blood and sometimes biting off chunks of flesh. In some cases, audience members who lost a bit of flesh were confederates who had been compensated in advance, in other cases they were just unlucky. It does not seem at all implausible that this should have occurred. We know for certain that slaves were sometimes killed for ceremonial purposes in the region, to gratuitously demonstrate wealth in a potlatch or so they could be interred beneath the foundation of a new lodge. In many aboriginal societies, mythological forms are played out with a deadly degree of seriousness. Photography: Many of the wonderful photos Edward S. Curtis took of Native Americans were published in a twenty-volume collection entitled The North American Indian, which is now in the public domain. Northwestern University hosts an online collection of the photos. 1) Boas F. and Hunt G. The Social Organization and the Secret Societies of the Kawkiutl Indians. from The Report of the U. S. National Museum. Government Printing Office. 1897. p. 418. 2) Boas and Hunt, pp. 407 ff. 3) Oberg K. The Social Economy of the Tlingit Indians. University of Washington Press. 1973. 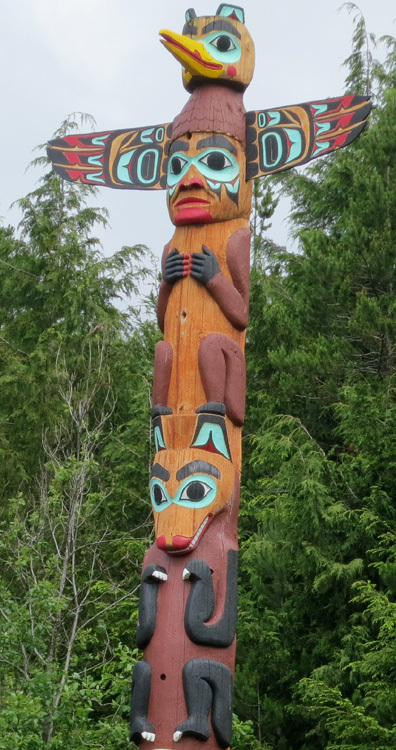 This post may be read on its own, or as a continuation of “Totem Poles of the Pacific Northwest.” Please click on thumbnails for full-sized images. Raven is the great culture hero of the Pacific Northwest, a trickster who figures prominently in myths ranging down the coast from the Arctic Circle to Vancouver. Raven is a complex figure, but in this analysis I’d like to focus on his role as the exemplar of shamanism, the dominant religious culture found throughout the region. By examining Raven’s shamanic character, we can ground the Pacific Northwest in a circumpolar cultural horizon of great antiquity, with roots that reach back more than 35,000 years to the Upper Paleolithic. Once upon a time, when the world was still covered in darkness, a chief and his wife dwelt in the town of Kungalas with their only child, a boy whom they both adored. When the boy had grown large, he fell very sick, and soon died. His parents mourned with bitter tears for their beloved boy, and invited all of the people to come and see his body where it was laid out. The chief ordered his son’s intestines be removed and burned, kept vigil with the body for many days. The shining youth said “Yes, it is I,” and explained that heaven had grown weary of the wailing of the mourners, and sent him back down to live again. The parents were overjoyed by this miracle, but it soon became apparent that the shining boy was not like the son they had known. Day after day, he refused to eat, giving his food to two household slaves, who were together known as Mouth-At-Both-Ends. One day, the chief found the corpse of his son stowed in the back of the room where he had been laid out, and realized the shining boy was not his son. But he loved the shining boy and would not give him up. Now, the boy had been watching the household slaves eat ravenously, and asked why they felt such hunger, and if they enjoyed eating. Surely they did! they replied, and told the boy that hunger had entered them when they tasted the scabs from their own shin bones. The boy decided that he, too, would taste the scabs of their shins, and when he put a tiny piece of flesh from Mouth-At-Both-Ends into his mouth, he became ravenous and began to eat. He ate and ate, day after day, until all the food of the village had been eaten. The chief knew he must send the boy away, or he would eat everything. He told him to fly over the sea, and gave him all kinds of berries to take, saying that the boy should scatter them about so that they would grow everywhere and he should have food. The basic features of the story are easy to interpret – the shining boy comes from outside the normal order of things. In order to fully enter the material world, he must partake of the flesh of Mouth-At-Both-Ends, the pair who collectively embody eating and elimination and, as such, embody the cycle of carnality. Other features of this story may strike the reader as bizarre, such as the boy’s sudden sickness, the removal and the burning of his intestines, and the substitution of the shining boy for the corpse. To explain those images, we have to dig into ancient strata. These symbols commonly occur in the initiation imagery of shamanism, which refers to a number of related visionary practices undertaken by a solitary adept. 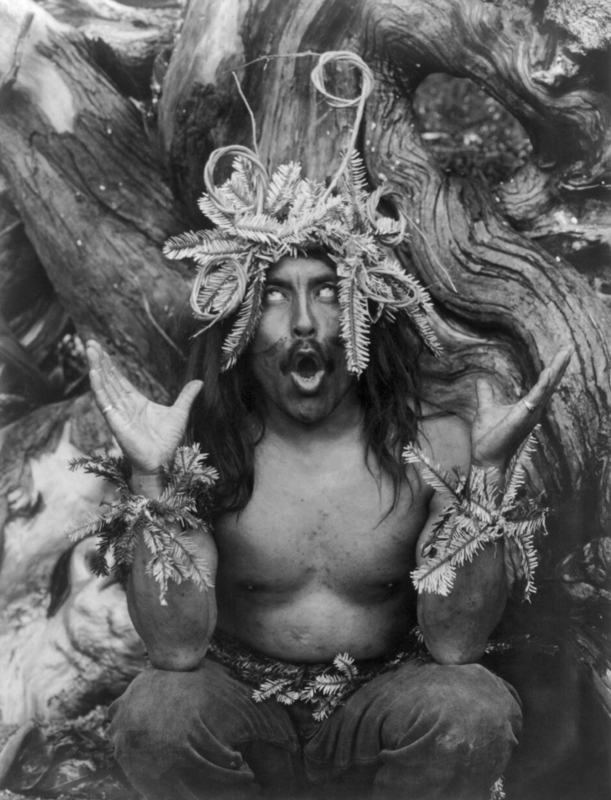 The shaman uses a variety of techniques to enter into trance states, during which he may travel into the sky, under the earth or into the sea, often assisted by animal guides. He uses his abilities to heal the sick, control weather, attack his foes, find lost objects, and so forth. Shamanism comes from ancient traditions of Siberia, such as we find among the Yakut and Tungus peoples, and its basic symbols are extremely old. Indeed, the earliest-known cave paintings, dating to the Aurignacian period beginning some 35,000 years ago, have been interpreted by leading experts as shamanic in character (2). 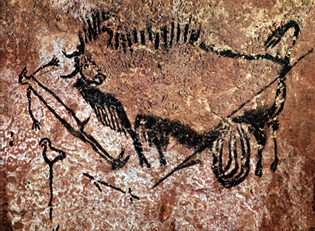 Cave paintings usually depict animal, especially images of the hunt. Cave lions pursue aurochs and horses, while bears, rhinos, and cave lions stalk the shadows. In paleolithic cave art, we find a number of animal images strongly associated with shamanism to this day, including the bear and the owl. In the post Totem Poles of the Pacific Northwest, we saw that the owl crest is claimed by Tlingit shamans alone. 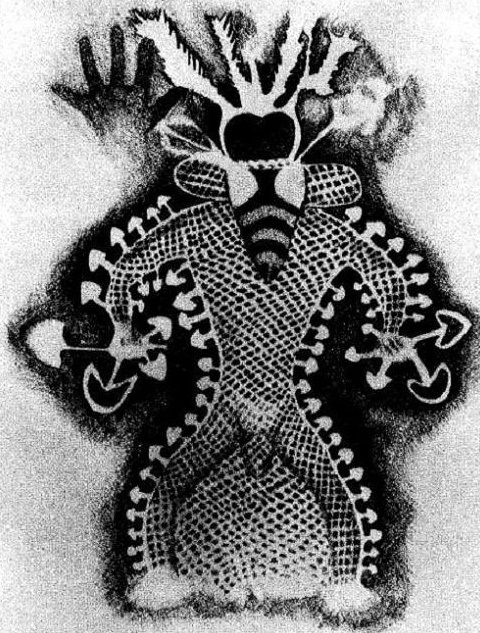 This painting from the cave of Lascaux, approximately 17,000 years old, is frequently interpreted as depicting a shamanic trance. We see a disemboweled bison transfixed by a spear, and a man lying prostrate, perhaps in a trance, with an erect phallus. 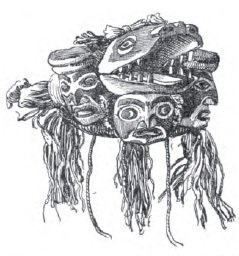 He has the face of a bird or is wearing a bird mask, such as the natives of the Pacific Northwest still wear in their sacred dances (see picture below). A bird sits on the top of a pole nearby, perhaps reminding us of countless bird-topped totem poles. Another figure strongly associated with shamanism in paleolithic cave art is the bear. We find hand prints stamped on cave walls that have were slashed by cave bear claws, symbolically linking the shaman with the bear (3). The earliest human altars may have been cave bear skulls that were carefully set on rock pedestals deep inside the great caves. We will return to the bear soon, but for now, to continue with our Tsimshian story of the Raven, the relevant point is that it contains unmistakable symbols of shamanic initiation. In his definitive study of shamanism, Mircea Eliade has documented numerous accounts of the career of the shaman, drawn from cultures throughout the world (4). In all cases, the decisive event in the shaman’s development is the sudden call to his vocation, marked by abduction or ordeal. In a typical case, the future shaman lives a normal life until the onset of adolescence, when he falls into a fever coma or vanishes from the village for months, having been abducted by superhuman shamanic masters. In Nepal, for example, young men are occasionally spirited away by the Yeti, properly called Ban Jhākri, and forced to toil miserably for years in payment for the magic songs they will need to practice their art (5). Note the significance of the number three here, which reminds us of Jonah’s sojourn in the whale, or Christ’s period of entombment. The number most likely derives from the three days during which the moon is dark, until it is reborn into the light. The initiatory vision of shamanism across a great geographical region includes this common feature of being ritually dismembered or eviscerated, and then purified, often with a theme of substitution, as in the case of Kurkutji, whose innards were replaced. This is just what we see in the myth of the raven, who appears as a substitute for the son who fell ill and died “once he had grown large,” i.e., at adolescence, and whose innards were excised and burned. Eliade identifies shamanic motifs in cultures throughout the Americas, from the Bering Straight to Tierra del Fuego (8). The shamanism of the Pacific Northwest is largely organized around the mythology of the raven. As a carrion eater, Raven mediates between the living and the dead. As a bird, Raven mediates between the heavens and the earth, and embodies the shaman’s magical flight. I cannot help but marvel at the close relationship we can uncover between our Tsimshian myth and the vision of a Bibinga shaman in Australia! That suggests a common ancestor mythology of enormous antiquity. The roots of this belief system were laid down before humans traveled over the Bering Strait, and before Australia was colonized. Let’s compare that ritual with a popular Tlingit myth concerning the hero Kats and his bear-wife. One day Kats went bear hunting, which is a very dangerous thing to do. Now, he was going after a particularly large and ferocious bear, and he found himself forced into the bear’s den, where he came across the bear’s wife. Kats and the female bear exchanged looks, and she fell in love with the hero. She took Kats under her protection, hiding him under the earthen floor of her den until her husband went away. In some manner that the story doesn’t specify, the female bear eventually took leave of her bear husband and married Kats instead, and together they had three cubs. One day, Kats began to pine for his old life, and he asked his bear-wife if she will let him visit his village. She was reluctant to let him go, for she feared that he would not return. At last, she acceded to his wishes, but warned him not to speak a single word to his human wife. Kats agreed. There is an interesting parallel here with the Celto-Germanic motif of the hero who journeys to the magic realm of the fairy queen, returning to the ordinary world only at the cost of his life, which we recently explored in our analysis of Tannhäuser. I will note in passing that there may be a genealogical connection here, as the pre-Christian religion of the Celts, and especially that of the Norsemen of northern Europe, exhibit shamanic characteristics. For example, the Norse All-Father Odin boasts impressive shamanic credentials, such as the nine initiatory days he hung from a tree in order to purchase the power of runes. In the case of Kats, the bear occupies a liminal position between the human and animal worlds, and the danger here is going too far outside the human order. In this sense, the bear is a mediating symbol; as the raven mediates between heaven and earth, the bear stands halfway between human and animal. The bear, like the shaman, is human-like, yet not human, and is therefore uncanny. In this light, I think of Timothy Treadwell, the subject of Werner Herzog’s documentary Grizzly Man. Like Kats, Treadwell got too close to the bears, and like Kats, he paid with his life. One of the things I’ve heard about Mr. Treadwell, and you can see in a lot of his films, is that he tended to want to become a bear. Some people that I’ve spoken with would encounter him in the field, and he would act like a bear, he would “woof” at them. He would act in the same way a bear would when they were surprised. Why he did this is only known to him. No one really knows for sure. But when you spend a lot of time with bears, especially when you’re in the field with them day after day, there’s a siren song, there’s a calling that makes you wanna come in and spend more time in the world. Because it is a simpler world. It is a wonderful thing, but in fact it’s a harsh world. It’s a different world that bears live in than we do. So there is that desire to get into their world, but the reality is we never can because we’re very different than they are. The line between bear and human has apparently always been respected by the native communities of Alaska. My sense is that the story of Kats and the bear helps steer people clear of the bear world, because you simply can’t go into it. If we view the story of Kats as a mythological image of the perils of the shamanic career, on the other hand, then we’re presented with an archaic image of great power and authority. 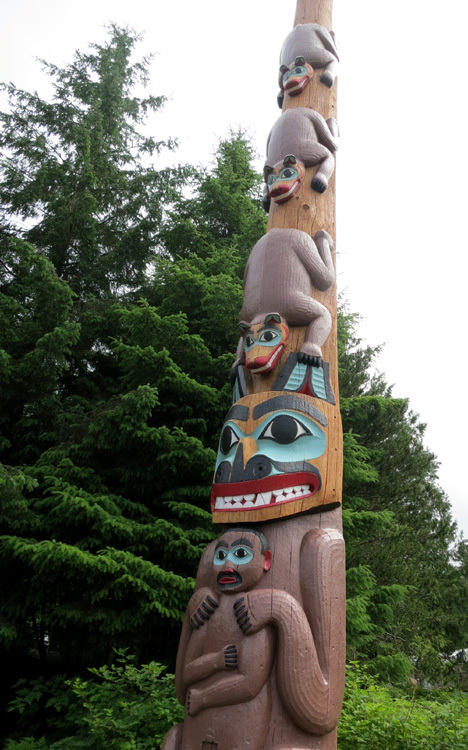 When we see the totem pole of Kats and his bear-wife, as we can see in the photograph above of the beautiful Tlingit pole in the village of Saxman, we respond to precisely the same image that we find in the bear paintings on the wall of the Chauvet cave – the same image that has spoken to people like us for tens of thousands of years. Next time, we’ll have more to tell about Raven as a trickster figure. 1) Adapted from Boas F and Tate HW. Tsimshian Mythology. 1910. pp 58 ff. 2) See, for example, Clottes J and Lewis-Williams D. The Shamans of Prehistory. Harry N. Abrams. 1998. 3) Campbell J. The Masks of God: Primitive Mythology. Penguin. 1969. pp. 339 ff. 5) Sidky H. Hunted by the Archaic Shaman; Himalayan Jhākris and the Discourse on Shamanism. Lexington Books. 2008. 9) Campbell, pp. 334 ff. 10) See, for example, Boas F. Indianische Sagen von der Nord-Pacificschen Küste Amerikas. Verlag von A. Asher & Co. 1895. pp. 328 ff. 11) Sturlson S., trans. by Jesse Byock. The Prose Edda. Penguin Classics. 2005. pg. 47. 12) Oberg K. The Social Economy of the Tlingit Indians. University of Washington Press. 1973. pg. 95. All photos (C) Barnaby Thieme unless otherwise noted. All rights reserved.